Remember how I told the internet that Dom has conquered much and this was in reference to his pneumonia? We had a rough week, but mostly, it was Dom that has it rough. His fever started Sunday, but after some ibuprofen, it was gone. Monday morning, it was back again, rearing it’s ugly-you-can’t-go-to-daycare head. Dad stayed home with Dom. Off to work I went feeling bad for a sick child. Tuesday at 2:00 am, the fever was climbing and Dom couldn’t breathe through his nose at all. Isn’t that the worse? All he could think to do was cry about it and you know how much THAT helps stuffy noses. I stayed home with him on Tuesday and we went to the clinic first thing. What started as a 20-minute visit turned into our entire morning as we went over to the orthopedic center for chest x-rays then back to the clinic for the pamonia (aka pneumonia) diagnosis. Off to get drugs. Dom barely slept in the car, which was probably more ideal than his crib as he was sitting up in his carseat. Back home again, I tried several times to put him down for an afternoon nap, but as soon as he was flat on his back, he’d wake up crying from his congestion. So his afternoon nap was propped up on the couch. Eventually Pogi joined, you see. Dom loved the trip and we were happy to have unseasonably nice weather in November. The best part was the tiger pacing near the fence. He’d stop and look right at us before turning the other way. What an awesome animal. He wasn’t close enough for a group shot with Dom, though, so no pic. Here are the other friends little man made… a bear (not to be confused with Bears) and seal lions! Dom went back to daycare Thursday and today and can even breathe through his little nose again. This certainly helps our nursing world. And bottle world. And sleeping world. And overall happiness. Boy. Noses sure do impact life. Daycare called me on Halloween to pick him up early. The culprit: a rash. Poor guy can’t get a break. He was still in good spirits, though, despite the skin irritations, and we continued on with our celebrations. He briefly donned a C3PO costume, but his bat costume really stole the show. 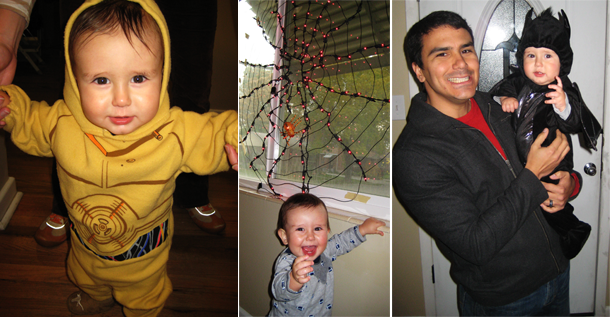 We also put up a smattering of Halloween decorations: spider-web lights as pictured; Halloween door mat; and a skeleton “pink” flamingo in the garden. It was the first year that we displayed our flamingo in a yard instead of in a pot. How fun! Dom had to stay home today until we could get a doctor’s note that his rash wasn’t anything serious. Nathan was blessed with the day off as well so I worked while they played. At one point, Dom decided to draw us a picture. That boy needs to work on his skills and decide if he’s right or left handed. Tough life decision. We haven’t taken many pictures of the new house because it’s still hiding underneath boxes. But here are pictures from ye olde condo living days. Those were the days. Okay so really those were pictures of Dom and Nate. They dominated those pictures (har har). But, you could see the walls and carpet of the old place. Neat. One of the tough decisions with moving, I find, is determining where to hang things in the new place. So far, we’ve only hung up one thing: a mirror. This mirror pictured below, in fact. It was horizontal, as you can see, in the condo, but it’s vertical in our new place. Alice was enjoying the reflection tonight as she sat at the table, looked down the hall and saw herself and her Mom, Laina. Reflections make for oodles of entertainment. Oodles. Dominic is superior to baby food. At least, he recently developed this complex. He expects to eat the same thing we are eating. Pureed mixed fruit? No. Thank. You. He only has two teeth (or perhaps I should say, he finally has two teeth) so we offer him the bite of the cheeseburger, but it’s not particularly productive. This makes filling him up at dinnertime a wee bit difficult. 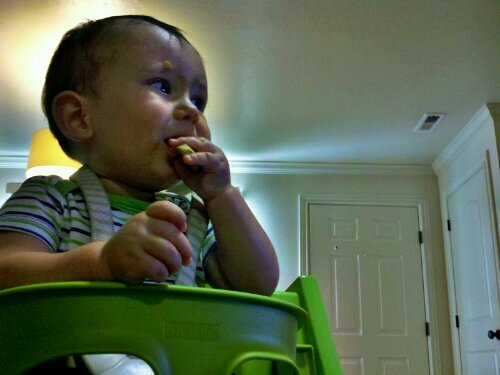 The other night, Nathan fed him some cheesy broccoli. He ate that great until I busted out the Papa John’s adult dinner. Then he only wanted our pepperoni/olive/peppers pizza. Eat up, little man. Who loves the camera? THIS kid. Who loves munching on blueberries? Also, THIS kid. 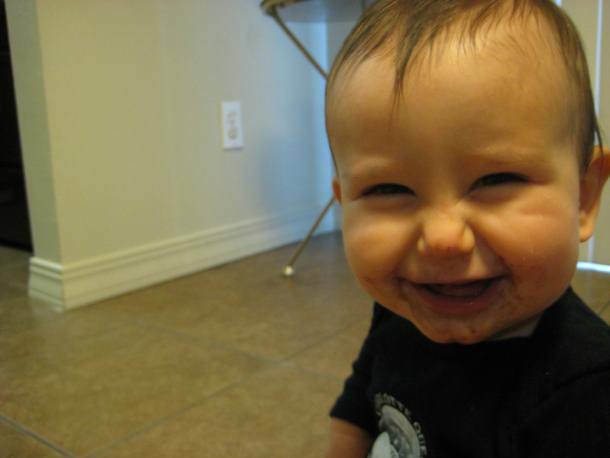 Dom’s a pretty happy kid and when he finds things he loves, his exuberance shows up all over his face, kind of like the purple blueberry juice. Yum. 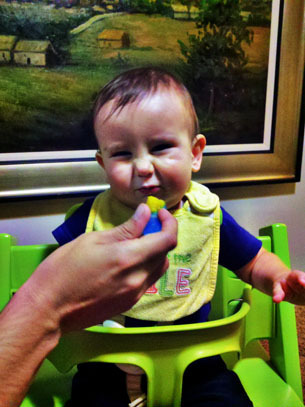 Dominic enjoyed his apple sauce, Sunday afternoon at my parents’. He sat in the old Stokke chair that I used when I was little. 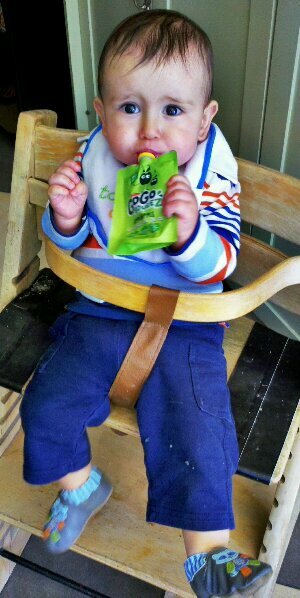 He has his own, green Stokke chair at home. We are fans of these chairs although the seat plate on his started to split already. I was bummed about this but tried asking the company about it on Facebook. They replied by sending us a new piece! Last night, Dom and I made a trip to the D.I. to find a few cheap outfits for him. Then we headed on home for his dinner. He ate some chicken and vegetables, with a few chunks, something he wouldn’t eat just 2 weeks ago. Then I gave him one of those squeeze packets filled with a fruit/veggie mix. I think he likes that he can feed himself with it. Then, he told me his three words: tape, dada, and mama. Useful words. Yesterday evening, Nathan was at class until a little after 9:00 p.m. so Dominic and I were on our own. We went on an outing together. We went to visit Aunt Natalie, our Auntie N.
The problem, though, was that she wasn’t really there. When we first arrived, a friend of hers was just inside the door and told us that she was sleeping. We talked with this friend (sorry, I forgot her name) for a while and then went in to see Nat before we left. As we went in, she opened her eyes. She was staring somewhere, but it wasn’t anywhere in the room. It seemed that her spirit wasn’t really there. I looked into her eyes and didn’t see my Aunt Natalie. She wasn’t smiling so clearly, it wasn’t really her. 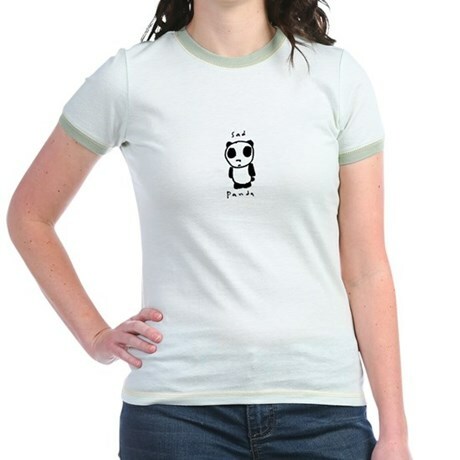 She turned to the side, looked at Dominic and said, “Hi, Dom.” Then she stared off again. Eventually, she asked for something. After having her repeat it a couple of times, I understood that she wanted the blinds opened, so I pulled them open and the sun brightened her room. She rolled to her side, facing the windows, and closed her eyes again. I knew that I already missed Nat. I knew that wasn’t really her in that body anymore. I wondered what it was like to already by in limbo because tumors have taken away the desire to be physically connected to her body and because the medicine must numb things as well. I also knew that I would forever be glad that Dom and I could make that visit last night. He won’t remember it, but I will. He won’t remember her, but I will. So I will teach him about her and how she always looked out for me and took care of me. I will tell him about what happened when he wasn’t even a month old yet. I was at home on a Sunday evening waiting for Nathan so that we could go to dinner at my parents. We would be late and I didn’t know how late because I didn’t know when Nathan would come home from church meetings. And then I talked to Natalie on the phone. She was at my parents for dinner as well. She didn’t usually go to Sunday dinners, but I suppose that she wanted to this time because she had just found out that she had cancer. I couldn’t even imagine what she was dealing with emotionally, but she was more worried about me. I didn’t want to admit it to anybody (let alone put it on the blog, even now after I’ve already been through it), but I was in a dark place and had post-partum depression. I had this beautiful little boy and I was so very sad so much of the time. And she knew. We were only talking on the phone, but she instantly heard it in my voice and knew exactly what to do. She told me to get in the car and come over. Nathan could come later. She knew that being home with just a newborn, watching the clock, and waiting, was not where I should be. That instead, I should be surrounded by family. She knew. The next week, she called to check on me. She was dealing with doctor’s appointments and finding out that there was so much cancer in her body that they would tell her she had six months left. And yet she was checking on me. She had also told my cousin, Laura, and my Aunt Annabel because she knew my sister and Mom were already checking on me, but wanted plenty of support. Because of her, I was able to admit that I should call up my doctor. I had an appointment. We could take care of this depression and I could better take care of Dom and be a happier wife for Nathan. Nat helped me be happier for my family. I will tell Dom about how Nat has always taken care of me like that. About how she knew I was struggling with money in college and so she came up with “work” for me by having me help her with computer issues. She kept track of the time I spent helping her and paid me for it. I tried to refuse, but she wouldn’t let me. She made her living as a violinist so I knew she wasn’t rich, but she was still more concerned about her “starving-student” niece than her own cash flow. I will tell Dom about how she would commiserate with me about the times when I couldn’t stand living in a condo with so much neighbor noise. About how she spent hours with me on several occasions organizing my life to fit into a small home. About how she was always there to talk to about dating and the single life. About how she was very straightforward with me about depression and other emotional struggles for both her and us, her family members. I will definitely tell Dom about when she lived in Palo Alto and invited Maren, Laura and I to visit her for New Year’s. Maren and Laura were freshmen in college and I was a sophomore. We borrowed the Suburban from my Dad (because none of us really owned a reliable car back then) and drove out to San Francisco. We slept on the floor in her living room on air mattresses she’d purchased just for our visit. Somehow, we were locked out once and she had me break in through her kitchen window (which I don’t remember very well now how I quite managed, but it worked). We experienced “the coldest day of our lives” as she warned us when we went out on the ocean in a ski boat to look for whales early one morning. We put on all the layers that we had packed and eventually Laura and Maren were sweating buckets and had to take off five or six layers. We didn’t see any whales, but we did see porpoises and man o’ wars. We celebrated New Years at some friend of hers from her ward and forgot to countdown until midnight. She was too concerned that if we went into the city to celebrate, it wouldn’t be safe. We did ride the train into San Francisco on our own one day while she was working. We met interesting friends. We rode the trolley; we took pictures; we spent a little money; we laughed the whole time. Then we went back to her condo and told her our stories. We still laugh about things from that trip, especially the coldest day of our lives. And I will tell Dom that I always knew that Natalie loved me. She didn’t marry nor have her own children. She didn’t feel like another Mom to me though, but more like the big sister I didn’t actually have. When we visited her yesterday, my big sister didn’t look or act like my big sister. It seemed that her spirit may have already started moving on. And I already miss that spirit, but when I saw the body it was leaving, I knew that this would be a release for her. Cancer is awful. 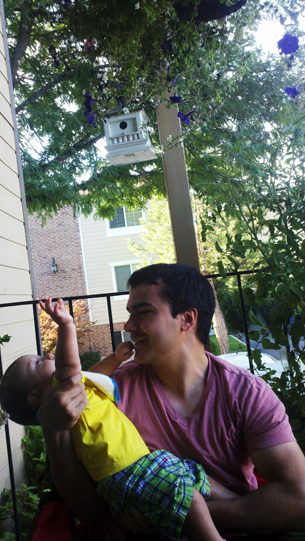 And I’m glad that I have this picture of Natalie and Dominic from an afternoon sitting on the backporch at Maren’s. Grandma DeeDee also joined us while Campbell played in the sandbox, making Dominic giggle and giggle. Nat took a video of his giggling on her cell phone. I didn’t get a copy so I will have to count on my memory to recall it. We were all very happy. We were all smiling. Natalie has a beautiful smile. We’ve been doing some work on the condo, but I’m saving that for a later post. Due to this, we spent a lot of time working on that over Labor Day weekend. I even have pictures… for later. Dom loves playing with his daddy. Nathan can get him to giggle. A lot. Saturday morning, we spent a little time relaxing on the porch, enjoying the slightly cooler weather. It was much better than the 100 degree days we’ve finished the summer with. The weekend was overcast and even a smattering of thunderstorms tumbled in. I was a little confused because, I had already replied to the Facebook invitation for the “After Party” so I figured they were getting married FIRST in order to party afterwards. What I didn’t know, though, was that their marriage was taking place in Salt Lake (they currently live in Seattle). Aaron and Nathan had been roommates for several years before he became my roommate. Ada had then become a roommate as well when she started dating Aaron. So once I learned the wedding was here, I understood why he was so concerned about missing it. Turns out, our invitation to the wedding part was lost in the mail. Boo postal service. Nathan rushed back out the door to at least show up for the pictures/food afterward and congratulate them. I waited for Dominic to finish his nap then we joined them at Jordan Park. They had a pavilion there and had put down white construction-paper tablecloths. I found their bucket of crayons and grabbed a handful. 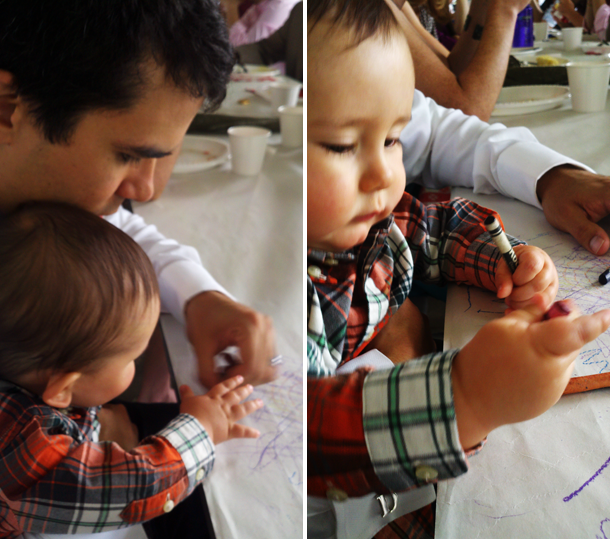 Nathan sat with Dom and tried to teach him to doodle. (What a funny word: doodle.) 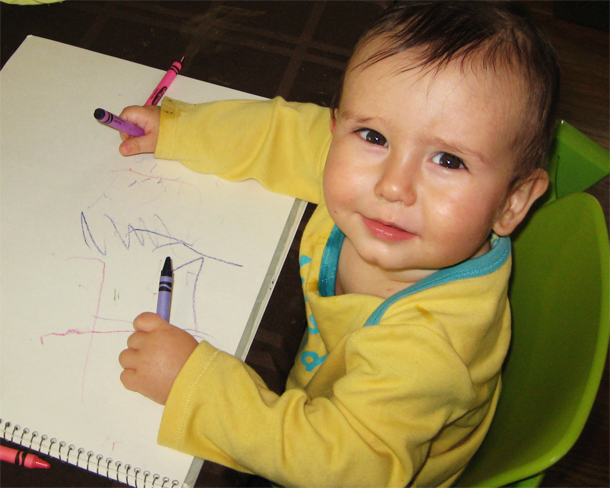 Mostly, Dom just attempted to eat the crayons, but he scratched out a few colors. On Monday, we were able to meet up with the now married Aaron and Ada for lunch at Gourmandie’s. It was nice to get them to ourselves and just sit down and talk. That’s not really doable with everyone around celebrating their wedding and all. 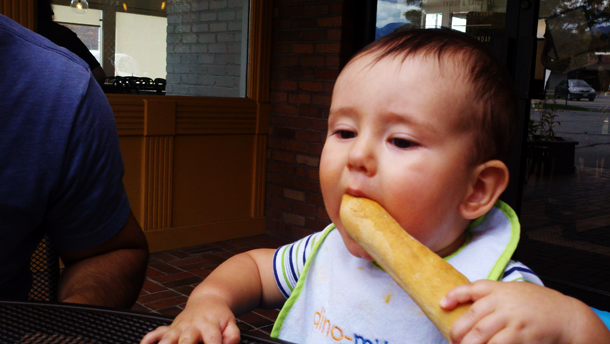 Dom enjoyed himself a breadstick. Did you labor or play for Labor Day weekend?